May 6-31, 2005 -- Can still photography convey nursing science? An exhibit of impressively diverse new photos on display at New York University (NYU) through May 31, 2005 "The Faces of Caring: Nurses at Work," makes a valiant effort. At times, it succeeds. And many of the images that will not really give most viewers a sense of nursing knowledge and skill still show the human connection that is a key part of the profession. Yes, people already know that nurses spend time with patients, and given our shared assumptions, some of the photos are susceptible to an angel reading. But they remind us of the joy and pain that nurses can share with their patients, even in the managed care era. Some of the photos are more artistically successful than others, but most have something to say about nurses and care today--even when the only "faces" you can see are those of the patients. The exhibit highlights photos chosen by an expert panel of nurses in media and professional photographers in a contest sponsored by the American Journal of Nursing (AJN) and the NYU Division of Nursing, with support from Johnson & Johnson's Campaign for Nursing's Future. (AJN editor-in-chief Diana Mason, who was one of the judges, serves on the Center's advisory panel.) The stated goal of the exhibit is to communicate to a "largely uninformed" public "the important work of nursing, as a profession grounded in science, technology, and knowledge," and to attract potential nurses during a critical global nursing shortage. In early May, the exhibit displayed three winning photos, nine honorable mentions, and a dozen "Judges' Choice" selections. AJN reportedly plans to publish the top 12 photos over the next year. Showing the public that nursing is grounded in science is a tall order for a group of still photographs without audio or much supporting text. In many of the images, we see nurses laughing or smiling with patients, helping them walk, feeding or cleaning them. Some of these have real power. Tom Fox's third prize photo of a Dallas nurse holding a new mother's head as the mother holds her baby is a simple but profound expression of nurses' holistic care--especially if you know that the parents have just been told that the young leukemia victim's stem cell transplant has failed, and that she later died, which most exhibit viewers may not. Photos by Mark Estes (honorable mention) and Edmund Eckstein (judges' choice) show nurses laughing and smiling with elderly patients, and one by Mary Rafferty Gerstein (honorable mention) has a smiling nurse soothing a baby. Nurses give a cancer patient juice and clean out a Veterans Administration hospital patient's eye, in shots by Nashi Un Nabi (honorable mention) and Rob Ostermaier (second prize), respectively. These may convey that nursing is "important work," though these kinds of images, without explanation, are also what cost-cutters and restructurers of the managed care era have regarded as optional work, and they have not been sufficient to attract enough resources or career-seekers to nursing in recent decades. It might have helped if viewers had access to more background information, such as that the nurse smiling at the three-month old baby has just cleaned the child's trachea opening. 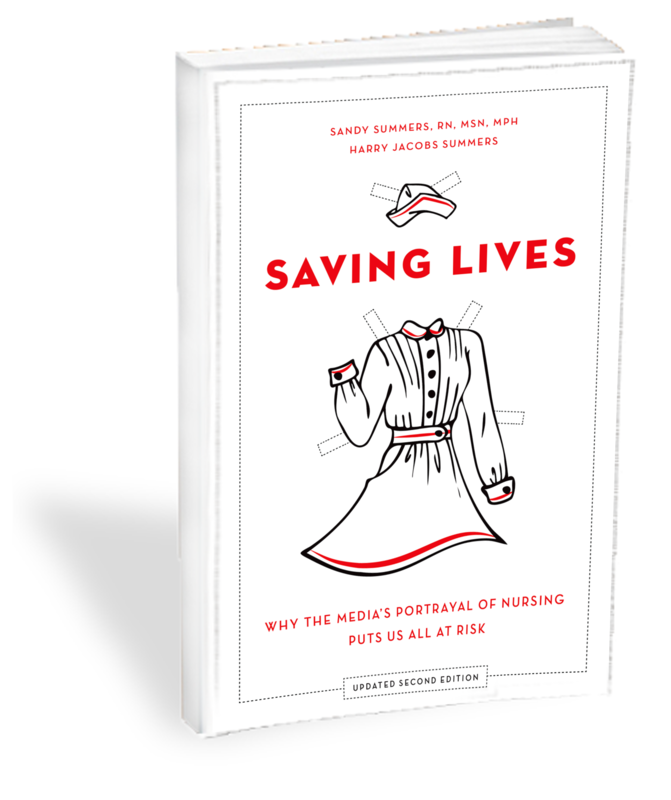 But what might really have worked to overcome stereotypes would be a sense of the full scientific basis for what the nurses are doing, some idea of why seemingly basic physical and emotional support often reflects scientific research and nursing skills developed over many years, and the knowledge that nurses are doing these things while making many potentially life-saving assessments. In other words, pictures may be worth a thousand words, but they cannot necessarily convey these words. To a large extent, this is not the photographers' fault: this is how nursing looks in still images, and the photo takers are not responsible for our assumptions and lack of knowledge. Photographers of physicians do not need to worry that viewers might not respect their subjects if they are engaged in tasks whose technical or life-saving nature is not apparent. It did not help that, at least in the early version of the exhibit we saw, the captions were limited, and the photos were all crammed onto one wall of an NYU student lounge, where it was difficult to really absorb them. The photos that show nurses doing things that obviously cannot be done by just any nice person are more likely to further the sponsors' policy goals. Many photos show nurses utilizing advanced technology. The most obvious examples may be Lisa Kyle's three striking shots from a burn unit in New Jersey. One, which won first prize, shows a nurse in full isolation who seems to be drawing up medication, but who is significantly obscured by a bank of four IV pumps with video screens and a dozen IV bags and tubing. Here is the modern "face of caring": a highly trained caregiver manipulating and monitoring a sometimes overwhelming array of technology. (What the heck is she doin' in there?) And between the nurse's isolation gear, the pumps and the profile angle of the shot, her actual face can't be seen well. Similarly, the other two Kyle photos (both judges' choice) show two burn unit nurses in full isolation help a small child walk with respiratory tubing, and undergo a procedure in bed while she grits her teeth in pain. In all three shots, nurses are focused handlers of modern technology, and to some extent prisoners of it; you half expect them to start making computer chips. They are helping patients in real distress, but you can't tell if they are kind or compassionate; to the child, the nurses might look scary. (Presumably the nurses are compensating for this in ways the photos cannot capture.) I'm not sure if Kyle's somewhat unsettling work will attract anyone to nursing, but it does seem to achieve the exhibition's artistic and social goals. There are no stereotypes on this burn ward. In other photos, it may not be clear exactly what a nurse is doing, or the most obvious task on view may not seem complex, but the nurses' care focus is so intense that most viewers will likely understand that she is doing something of vital importance. Kevin Buehler's shot of an ED nurse checking a patient's blood pressure (honorable mention), Stephen Holt's photo of a labor and delivery nurse examining a patient while a nurse midwife watches just as intently behind her (honorable mention), and Karen Pulfer Focht's photo of three NICU nurses caring for an infant in an incubator (judges' choice) capture nurses in moments of total concentration--do not get in their way. Even in these photos, more words would have helped: in Focht's, the nurses are resuscitating an infant who has stopped breathing, something that most viewers will not get. They will get that, whereas in the first prize photo the care technology obscured the caregiver, here the caregivers hide the tiny patient. The resources we can now bring to bear on illness (and other modern problems) are astonishing. We have to make sure they don't swallow us. The exhibit is diverse. There are many successful entrants from the University of Utah (perhaps because of an institutional push for entries?) and many from burn units, though all these were from two photographers. And most of the photos are from U.S. hospitals. But we also see a certified nurse midwife teaching midwives in Afghanistan, Thai nurses helping tsunami survivors in a relief camp, a Guinean nurse preparing to vaccinate local children for measles, and a Bengali nurse in Nashid Un Nabi's cancer hospital photo. Several photos show home health visits in a remote Eskimo village in Alaska. Care settings thus vary from the flashiest high-tech to the seemingly basic, from urban to rural, and from developed to less developed nations. The exhibit shows patients--and nurses--of many different races and genders. We see patients in joy and pain, in hope and despair, and more or less from the cradle to the grave. On the other hand, we see no one clearly involved in nursing research--and virtually no patterned scrubs. There are no nurses in a war- or terror-related setting, apart from the VA hospital patient. Aside from a photo by Roger Tuttle of a burn trauma ICU team, we do not see nurses collaborating with other caregivers, though coordinating care is a key nursing role. Moreover, despite all the acute settings, we see no nurses with dead patients. These aspects of the exhibit may be coincidence, or something else; we will resist speculation. "Faces of Caring" is a serious effort to increase understanding of the importance and diversity of nursing. At the same time, it offers some gripping, thought-provoking looks at the front lines of modern health care. See the exhibit at: New York University, Helen and Martin Kimmel Center for University Life; 60 Washington Square South (at LaGuardia Place); New York, NY 10012. Hours: May 6-31, 2005, Monday-Friday, 8 am-9 pm; closed on weekends except May 14-15, 2005.